Images Archives - BeSocial Event Management Inc.
Back in China, Eli Sun was seen as a very well educated man with a Bachelor in International Business and Finance and a Master’s Degree in Business Administration. Strong qualifications matched a successful career with an International Public Trading Company. Coming to Canada together with his wife and son, was a dream come true and an unforgettable journey. Eli Sun was very successful in China, now he needed to do the same in Canada, if not for him, for his family. It seems that all the successful people have two things in common: perseverance and the willingness to succeed. Eli Sun was no different, once arrived in Canada, he enrolled into several high level training courses. He knew he had to learn the Canadian way or the so called ” Canadian experience”. His first job in Canada: Assistant Manager at Starbucks. You would think that someone with all these amazing qualifications would find it easier to get a job but it doesn’t go this way ..as an immigrant, you need to prove yourself first, you need to show that you are reliable and serious about your career. One day, after having a conversation with one of his classmates, Eli Sun decided to research on the Internet various companies in the financial industry. Although Eli Sun has learned a lot in his position at Starbucks, he knew that it was time for a career change. Eli Sun knew what he was looking for: a well-established company with a proven track record of success in the financial industry. “If people don’t know me, they will know the company, “ said Eli Sun. He wanted to work with a company that embraces diversity, and offers unlimited carrier opportunities and advancements. Eli Sun wanted to leverage his strengths in developing a business, creating marketing strategies, teaching and helping Canadians to achieve their financial goals. From a conversation with one of the students, to taking action and contacting financial firms, Eli Sun landed a job as Financial Security Advisor at Freedom 55 Financial. 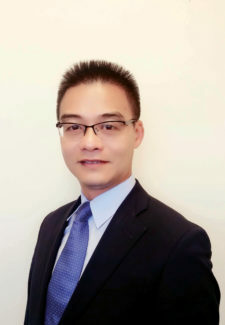 After ongoing education, trainings and support, as well as exceeding all targets, Eli Sun proved he was now ready to become the Director of Business Development at Freedom 55 Financial. The moral of the story is that nothing happens by chance. You need to make it happen. Prepare yourself for success, as when the opportunity knocks you must be ready. VELVET AVENUE AND URBAN CURLS TORONTO LAUNCHES BEAUTY AND STYLE EXPO! What an event last night! The inaugural Beauty and Style Expo hosted by Velvet Ave and Urban Curls Toronto offered an amazing show bringing together the most esteemed stylists, hair and makeup artists, vendors and sponsors. The launch of the Beauty and Style Expo comes at a time when makeup, hair, fashion and beauty is more important than ever. Whether the look is natural, classic or fashion-forward, this event was meant to help customers experiment with trends and develop a look that’s all their own. Alicia McNamara oversees wardrobe direction as the Stylist for ET Canada. Serge El-Azzi is a luxury lifestyle and fashion influencer. EVENT ORGANIZED BY – BeSocial Event Management Inc.
Google was founded by Larry Page and Sergey Brin while they were Ph.D. students at Stanford University, California. Together, they own about 14 percent of its shares and control 56 percent of the stockholder voting power through supervoting stock. In May 2011, the number of monthly unique visitors to Google surpassed one billion for the first time, an 8.4 percent increase from May 2010 (931 million). In January 2013, Google announced it had earned US$50 billion in annual revenue for the year of 2012. This marked the first time the company had reached this feat, topping their 2011 total of $38 billion. For Many years on Fortune magazine’s list of the best companies to work for, Google ranked first . 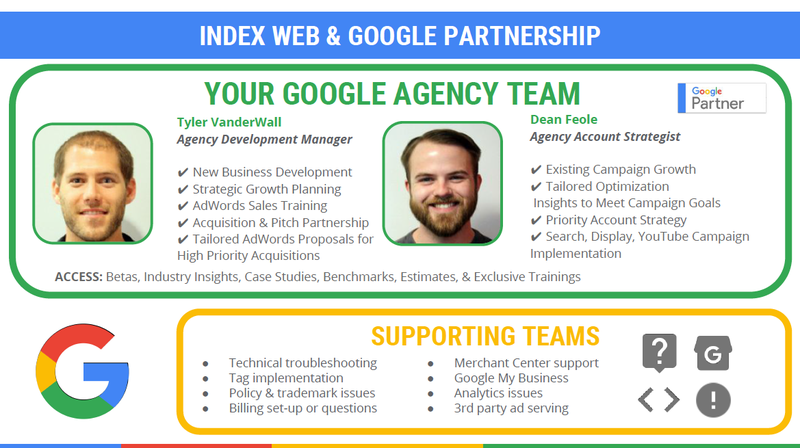 Tyler VanderWall is a Google Agency Development Manager, he specializes in helping digital agencies grow, by providing strategic support for your agency, dedicated support for your priority AdWords accounts, and integrated support between key account management and acquisition. Working primarily with Google Partnered agencies, he collaborates and consults with digital marketing executives to highlight acquisition and new business development opportunities. Dean Feole currently enjoys being involved in the Google AdWords ETO team in the Canadian market. As an Account Strategist he specializes in building and optimizing professional AdWords campaigns for greater efficiency at scale. After talking to Dean and Tyler and other GOOGLE specialists we’ve come to the conclusion that time spent with TV and Print are declining, while time spent with Digital media is increasing and there are 1B+ GOOGLE users that reach millions of people, across their entire day. If you never thought of GOOGLE advertisement, talk to one of the GOOGLE specialists; find out if advertising through GOOGLE or YouTube would be the right avenue for you and your business. Did you know that 51% of smart phone users have discovered a new company or product when conducting a search on their smartphones and that 1 in 3 smart phone users have purchased from a company or brand other than the one they were seeking because of information provided in the moment they needed it? You have a chance to win your competitor’s customers by just showing up or by simply being present in the right moment. Of course we need to add an important ingredient, being present is not enough, you need to be relevant and valuable. 51% of smartphone users have bought from a brand other then their intended one because the information provided was useful and 61% of smartphone users say they’re more likely to buy from companies who customize information to their location. At our GOOGLE event on August 17th, 2016, Google’s team shared few videos with our guests and we thought you might want to check them out. Life is lived in moments. And today, so many of these moments are mobile – whether we’re enjoying a new playlist, sharing a vacation photo with family, or checking in on what our friends are up to. What is a GOOGLE Partner? Why would you choose a GOOGLE Partner? Google Partners is Google’s program for advertising agencies, digital marketing professionals, and other online consultants who manage AdWords accounts. Achieving Partner status means that you’ve demonstrated AdWords skill and expertise, delivered agency and client revenue growth, met AdWords spend requirements, and sustained and grown your client base. Check out this video. Last but not least, check out the YouTube Directory, demonstrating how the new app for YouTube easily guides Businesses through creating a professional quality video for your business using your Mobile! Your Customers are looking for YOU – Online! What are you doing to ensure they will find you? For most companies it’s extremely frustrating to see their marketing money wasted on ads that never convert into revenue. Digital Marketing today is more effective than any traditional advertising and more cost efficient! Website, Social Media, Video, Email, Blogging, What should you do? DMX are Google Partners, with a Google certified team. At DMX they know that great design, search engine position or even the newest technology, alone, will not be enough to effectively maximize the power of the internet. It is through the combined strength of the DMX network of creative, analytical, technical and business minds that can best ensure success. That’s an important distinction between DMX and traditional Web Designers, as they focus on delivering true online marketing business solutions, rather than simply creating websites. At DMX they believe that “Your website is just the beginning!” and that a well-Integrated Digital Marketing Strategy is crucial for enhancing your brand image, building consumer confidence, increasing their willingness to do business with you, and converting them into actual customers. Join the Google Team as they lead an interactive online/offline seminar. Answer your questions about all queries concerning online marketing and show you how to optimize GOOGLE and YOUTUBE advertising to enhance your business. My name is Tyler VanderWall and I am a Western Michigan University Alumni. I received my Bachelor of Business Administration from the Haworth College of Business in the Spring of 2014. I majored in Advertising and Promotion, minored in General Business, and also received a specialization in Sports Marketing. I help small to medium sized business Google Adwords advertisers optimize their online marketing campaigns to save them money, improve the efficiency of their accounts and help generate their overall brand awareness as needed as a free support service for Google. I was a manager for the Ontario Government and was studying for my MBA when I snuck in a marketing course. I discovered that I loved marketing and it was if I had found my calling. My partner encouraged me to take the leap of faith and start my own business. I found out that a good way to get into business without too much risk is by buying a franchise, so that’s what I did. I bought a franchise through WSI (We Simplify the Internet). They had all the training I needed to learn the expertise of online marketing and also the structure of a franchise. It was a good start and I owned the franchise for about a year and a half when I realized I was meant to be more than just a franchise owner. That’s when DMX was born. About a year and a half after DMX was established, my partner and I were approached by Google to join their Google Partner Program.We had to complete all the certifications required and have a certain number of customers who use all the different advertising platforms such as search,display and youtube. Google is God in the online world. Google services basically everything online, so it wouldn’t make sense not to be partnered with them especially if you are in online marketing. 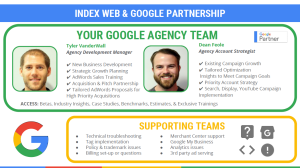 Being a Google partner has many benefits for us as a business and our clients. As a business we get constant updates via workshops and training and insights into googles beta testing which we can then share with our customers. Create a facebook page – sponsor a story and get it out there. Make sure you target it properly. Use one of the free websites found online, it may not be unique but it serves as your business card online. Advertising on Youtube is the new norm and is the most effective way of getting the word out there about your business. Youtube influencers are the new phenomenon. They draw kids and adults alike to their channels and actually have a “following”. These channels are much more effective than any TV commercial we’ve seen to date. Setting up your own youtube channel enables you to not only advertise on it but monetize it too. When you set up your youtube channel, you can give permission for videos to be shown on it. If you get enough traffic to your site youtube will start showing their advertisements on it and you’ll get paid, thus win – win. Social media is your personal networking on steroids. You meet someone in person, connect and engage on social media and then reach out to their network building your network hence the viral nature. Going viral in business is when you introduce your concept to your audience and ask them to share it with their connections and so forth so that it spirals and reaches more and more people. The number of followers you have is not necessarily an indication of success unless they are actively engaged. On social media it is more important to have an engaged and active audience than merely numbers. Facebook will punish you and your page by not showing any of your content if the algorithm indicates your group is inactive. So rather have 100 engaged followers than 10 000 inactive ones. Having many followers can be a double edged sword. Many followers can be good for branding and lends credibility to your business. But on the flipside it can damage your brand if there are lots of “likes” but no one is commenting on your posts or watching your videos. So be cautious. Video is becoming the front-runner with facebook introducing a new live feed feature. Instagram has increased the length of their videos to 30 seconds. Even though many businesses don’t want to hear this but online advertising is becoming a necessity. Instagram is growing and I recommend that every business should be on instagram. Instagram has surpassed Twitter and is now a sensation with all audiences. Paid advertising pays off. If you have a marketing budget do some google advertising. If you are looking for customers to find you, help them along by advertising. Being on Googles first page is crucial since you have only 30 seconds to be found. Many businesses make the error of spending money developing a website but then fail to market it effectively. 2 effective ways to get your website found is through SEO which is organic and then generally through advertising. You could try blogging as long as your blogs are tagged with key words. Also always have something on your website to make people do the action you require from them. Use “Call to action” buttons which allow customers to call you or download relevant information. “Pop ups” are making a comeback and are the new trend in getting people to engage with your business. Social media platforms for females aged between 18 and 44. Linkedin for males. If you are not online YOU NEED TO BE. Arlene Dickinson is one of Canada’s most renowned independent marketing communications entrepreneurs. As the CEO of venture communications, her creative and strategic approach has turned her company into a powerhouse. BeSocial was surprised by the Bloomberg statistic stating that 8 out of 10 entrepreneurs fail. Daniela Spirlac asked Arlene Dickinson to share her insights on why this occurs and how to overcome it. Many quit because being an entrepreneur is hard work. It takes sacrifice, perseverance and creativity to be successful. As an entrepreneur you will face many challenges and have to overcome many obstacles, however, the trick to survival is, if something doesn’t work change it. Don’t give up without a fight. Prioritize your business objectives and focus on what is important. Don’t get swamped by the everyday nitty -gritty and lose sight of the big picture. Be confident about your unique selling proposition, articulate what you need and develop a sound business strategy. It is also prudent that you know who your competitors are, their strengths and weakness’and their position in the market. Keep abreast of changes in the market and implement new and innovative ideas which will enhance your business in the future. Align yourself with people who share your vision. Let go of those who under-perform and hinder progress with their negativity. Canada needs to invest in entrepreneurs and programs that are midway not just the start-up’s. Business takes time to get on their feet and many fail in the first 5 years so it makes sense to support those which have already proven their sustainability. 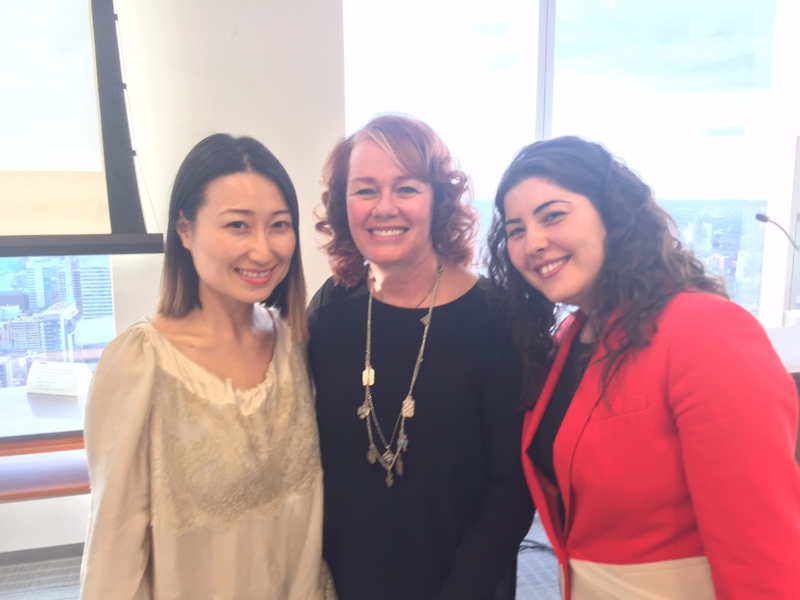 7th Annual eWomenNetwork Success Summit hosted by eWN & BeSocial Event Management Inc.
BeSocial Event Management Inc. & eWomenNetwork were the proud hosts of the 7th Annual eWomenNetwork Success Summit held in Toronto on May 26th. This prestigious gathering of entrepreneurs was held at the historic Albany Club, where excellent service and delectable food complimented the unique array of exhibitors and a dynamic speaker. Sandra Yancey, the founder and CEO of eWomenNetwork was the featured speaker of the night. This remarkable lady had her audience captivated as she took them on an emotional journey, giving them glimpses of both her personal life and business secrets. By sharing these personal anecdotes and words of wisdom, Sandra encouraged each entrepreneur to “soar with the eagles” – to be courageous and follow their dreams in business and in life. The answer is always NO, if you don’t ask. Give yourself permission to succeed. You can’t build a million dollar dream with a minimum wage mindset. Success is hard, so is being broke. Nothing happens to me, it happens for me. Ken Kragen is an author, speaker, non-profit consultant, TV & film producer and music manager. In 1985, he was instrumental in securing the talent that appeared on the fund-raising single and album We Are the World. Harry Belafonte contacted Kragen, who was then managing Lionel Richie and Kenny Rogers, about putting together a concert to help raise money for African causes. We are so proud that Daniela Spirlac the Director of BeSocial Event Management Inc., was able to meet and connect with this icon. Ken Kragen and “Hands Across America” the largest public demonstration ever created. It brought together more than 6 million people in a continuous hand holding line from New York to California for the purpose of raising money and awareness of the plight of the hungry and homeless in this country.